JEAN-BAPTISTE MORIN (1677-1745): La Rose, FRANÇOIS COLIN DE BLAMONT (1690-1760): L’Europpe, PHILIPPE COURBOIS (?-1730): Ariane, MICHEL BLAVET (1700-1768): Sonata II in B Minor, Op. 3/2. Description: Shifting its attention away from Italian baroque cantatas and oratorios for the moment, this label gives us three first recordings of French cantatas from the first half of the 18th century, two with Greek mythological subjects and one celebrating the triumph of the rose in the gardens of the French aristocracy. the forces are soprano, flute and continuo of theorbo, baroque guitar and harpsichord. French-German (!) texts. 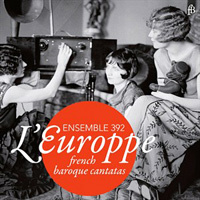 Ensemble 392.